Martin Luther King – I have always loved this man, innovator, writer, speaker, civil rights leader, a true leader led by God. As a child of 10, I cheered and wept with every one of his speeches until his untimely end. I could hear the truth in his words. I felt them resonate with my soul and saw them as divinely inspired. On my quest to paint every national park in America, my “National Park Painting” series focuses on the 59 parks with the highest national rating. That alone is a tall order when you consider I travel to each national park from coast to coast and it includes Hawaii and Alaska! Yet, I felt compelled to include one of the national monuments of Washington D.C., to show how our parks preserve America’s historic development as a nation as well as preserving our precious open land. Always remember that our national parks are our birthright as the American people. To quote Theodore Roosevelt, the 26th president of the United States, who said that the national parks were created “ for the benefit and enjoyment of the people.” In that speech he reminded people of this essential democratic principle embodied by the parks. My favorite national memorial, like many Americans, was always the outstanding Lincoln Memorial. After a more recent experience on the National Mall, walking the winding, well-worn path through history, my eyes set on the Martin Luther King, Jr. Memorial and I was mesmerized. Then I noticed how the crowd around me was also in awe and fell speechless. I felt appropriately humbled next to this great sculpture of a great leader among mankind. Truly this sculpture is a marvelous portrayal and tribute in it’s massive size and presence. 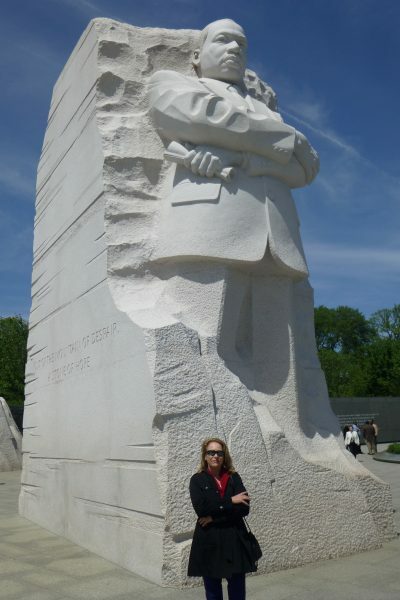 I felt the pure white granite was representative of Dr. King’s pursuit of pure truth and justice, not just for some. 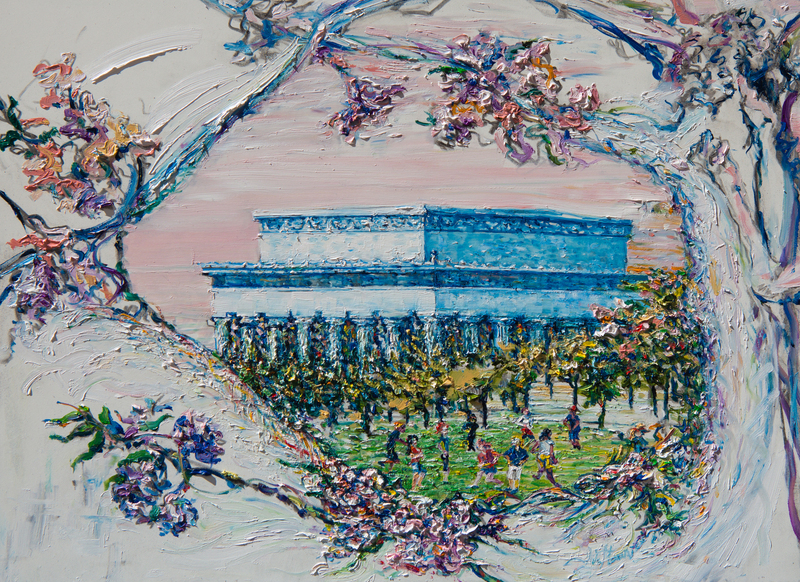 The artist’s painting of the Lincoln Memorial, part of her National Park Painting series. The sculptor Chinese master Lei Yixin created this 30-foot work of art with guidance from a foundation and the Luther family. This newest of memorials was dedicated in 2011 and stands on the National Mall. I liked how they placed the Martin Luther King, Jr. Memorial appropriately near the Lincoln Memorial, two great humanitarians who shared the inspired dream that all men are created equal. See Fitz Maurice’s quest work at nationalparkpaintings.com Work by the lifetime artist and 30-year Laguna Beach resident has been exhibited and collected internationally. The Hockaday Museum of Art in Montana plans to exhibit Fitz Maurice’s series this June and July, 2018. Posted in News and tagged Dr. Martin Luther King, Lincoln Memorial Monument, Martin Luther King Jr. National Memorial, National Memorial Park, Tribute to Martin Luther King Jr., Wash. D.C., Washington D.C.